While being pretty much stuck to the indoors here in Dubai, where the Summer has started, it is a perfect time to experiment with some new image editing software. Those of you that have been following me for a while, know that I'm a huge fan of the Nik Software collection (now owned by Google); especially the Color Efex Pro 4 and Silver Efex Pro 2 plugins for Photoshop and Lightroom. Some time ago, Nik Software came out with their latest plugin called Analog Efex. Even though I tried it, I never included it in my workflow and found it a bit gimmicky. Recently they came out with the new version, "Analog Efex Pro 2", a complete different ball-game and free upgrade if you own the previous one! Without doing a full software review, it is a plugin that lets one "develop" (edit) digital images and give them an analog "film" look. To start of, there are a large variety of presets (also referred to Classic Cameras) where one can change things like film types, vignettes, add light leaks, film grain (different to noise!) and even add dirt and scratches. Even though I did not use the features on the image below, there is also an option of doing double exposures, add rotation blur and even distortion... A perfect boost for my photographic creativity! The image below was shot a few weeks ago at Lake Orta, North of Milan Italy. As I don't like to use "modern" features when giving a film look to a photograph, the old wooden boat with the island of San Giulio in the distance, makes for a great candidate! Expect to see more Analog Efex Pro 2 goodies, as the humidity and temperatures in Dubai are on the rise. 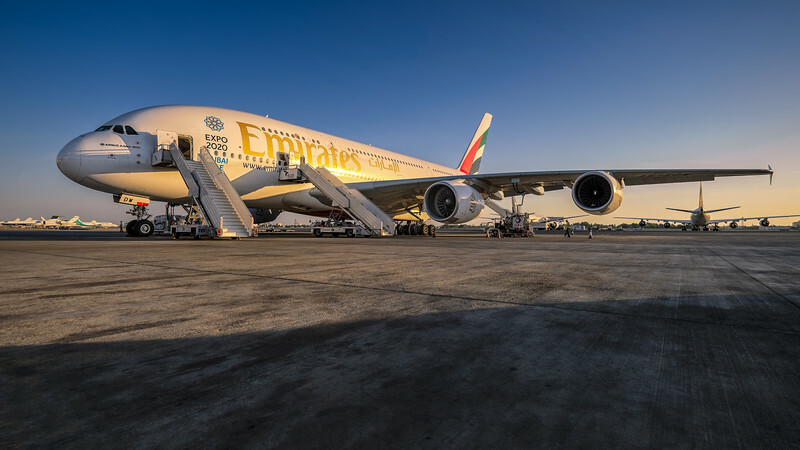 Even though the Airbus A380 is definitively not the most attractive aircraft around, it proofs to be extremely popular with passengers and the pilots flying it. A selection of my A380 photography work over the last few years can be found here. The image below was shot during my external walk-around inspection, before flying back to Dubai at an undisclosed airport near you! I was especially attracted to the great quality of the late afternoon light and bracketed three exposures handheld in order to cover my bases. Using the wide-angle it gives the aircraft somewhat of a slimming effect. Pretty happy with the resulting image, which at some stage, might make it into my Aviation Portfolio. Remember; "The sun always shines above the clouds"
Having just sold a Nikon D800 body, one of the main concerns of the buyer was if the screen was 100% free of scratches... And yes it was! 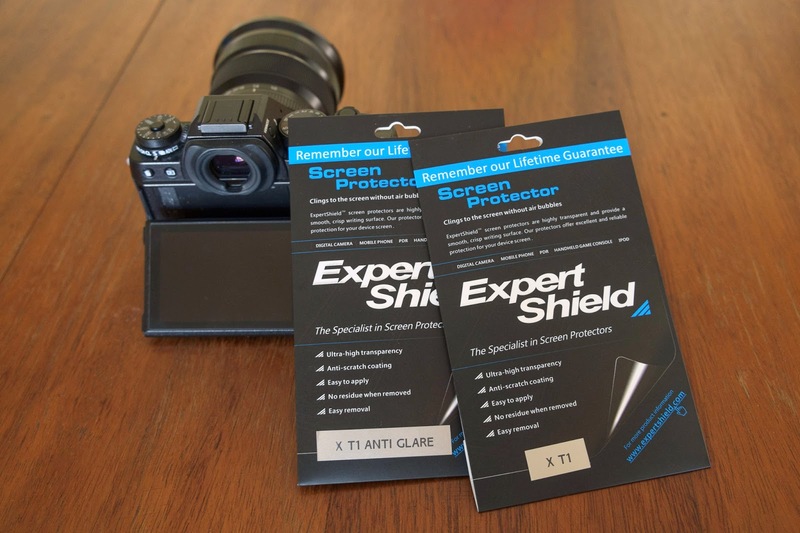 Last month, I was contacted by the fine guys at Expert Shield UK, asking if I would be interested in reviewing a pair of their Fujifilm X-T1 screen protectors. And they couldn't have emailed me at a better time. My X-T1 which was less than two months old, had a "cheap" screen protector which I picked up in a large computer mall in Singapore shortly after I got it. Probably paid just under 10 USD for it and that included the cutting from a larger sheet and the perfect fitting by the attractive Singaporean sales girl. Even though it looked like she did a great job, the little plastic protector did come slightly loose less than two weeks after that. Bummer! Expert Shield, send me two protectors for the X-T1 to test; one normal and one anti-glare. Unfortunately I only have one X-T1 body so I couldn't do a side by side comparison. Putting on screen protectors on any device always makes my heart beat faster. Who knows, it might be an alternative for a workout! LOL. It is never something I look forward to do and that is probably why I thrusted my Singaporean friend in the first place! Here we go; clean the screen with the provided small cloth, partially remove layer 1, lay out the protector on the screen, (starting on the exposed end of course), once in place go out bubble busting using the cloth and a credit card (doesn't have to have any credit on it however! -;) ), once done remove layer 2 and your are done for the day! Normal or anti-glare, that is the question? I started with the Normal for a week of shooting and then switched over to the anti-glare one. The latter one has a matt finish and obviously reflects the light differently. Having shot in a variety of conditions all the way from 45C bright sun-light in Dubai, getting wet on the beach near Los Angeles to two weeks in Italy with sun and rain, it isn't an easy decision. Expert Shield has screen protectors for all kind of cameras, ranging from the smaller compacts, through most of the new mirror-less bodies to the full Pro DSLR's. Present price for all Fujifilm X series camera screen protectors seems to be standardised at 12.95 USD or 7.95 GBP for European customers. The box includes one protector, a soft cloth and a good explanation how to best apply the film. Orders can be placed directly through their website or through third party sellers like Amazon. Lastly all Expert Shield protectors come with a life-time warranty against scratches. They've even tested them by running belt sanders over them. Check out this cool video here. DISCLAIMER: Even though, I'm clearly not affiliated with the company, I can after extensive 3 week testing, recommend Expert Shield to anybody looking for a high quality camera screen protector! Talking about time, this week is the 5th year anniversary of this blog. The numbers of readers of the BMP blog have over the years steadily increased. Looking at the demographics, they now include people from all over the globe; even Greenland! Yes, Antarctica is still missing... I've made great contacts through this medium, but more importantly managed to help people with their photography; my nr 1 objective when this blog was started just over 5 years ago! 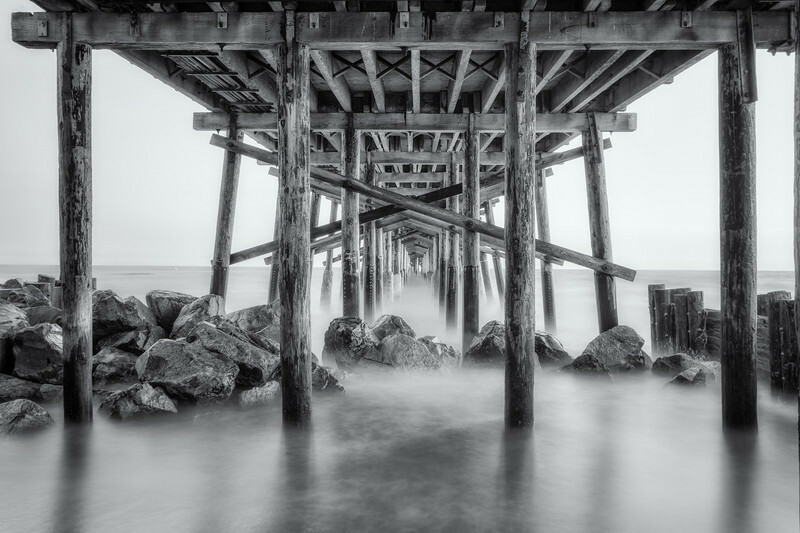 A great place to test this was under the wooden Newport Beach pier near Los Angeles a short while ago! As I wanted to get below the pier right on the water line, I had to find a way through a couple of fences. No..., didn't break any! Last month, I picked up a Tiffen 3.0 (10 stop) Neutral Density (ND) filter for my new Fujinon 10-24mm wide-angle lens. Any readers not familiar with ND filters? Well, look at them like very dark sun-glasses for your lens. So dark that the human eye can't even look through it but your camera can! By removing 10 stops of light, it allows the photographer to shoot a much longer shutter speed, leading to a nice, smooth and silky water surface. It is an essential tool if one wants to do "Long Exposure" photography when there still is too much available light. The image below, consists of 4 different exposure at varying shutter speeds between 7s and 30s. This way I was able to look deep into the shadows of the rocks and wooden pier structure, as well as into the highlights of the sky. Just over two months ago, I started planning a landscape photo-adventure to the Isle of Skye (Scotland-UK). While searching for accommodation it was clear that the ideal locations for a photography trip had all been booked already... Time to work on plan B! 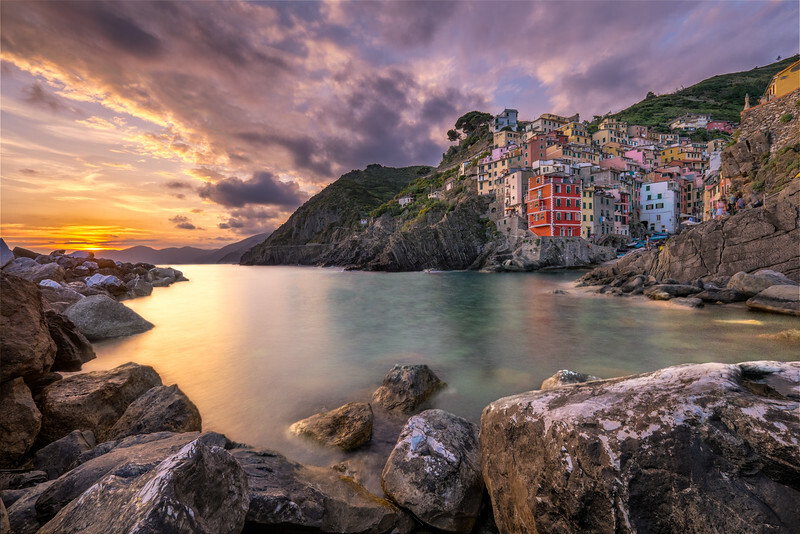 It was American Travel photographer Elia Locardi, who last year fuelled my appetite for the UNESCO world heritage site; CINQUE TERRE in Northwestern Italy. The Cinque Terre National park in the Ligurian region is located about 250km SW of Milan and only 100km SE of Genoa. It consists of 5 remote villages right on the coastline, which until the 1960's could only be reached by boat and train. Because all but one ( Monterosso) village, are largely car-free, we elected to take a three hour train ride from Milan instead. In hindsight this proved to be a very wise decision! Accommodation in the 5T villages consists mainly of furnished apartments and is limited to only a few hotels per village. 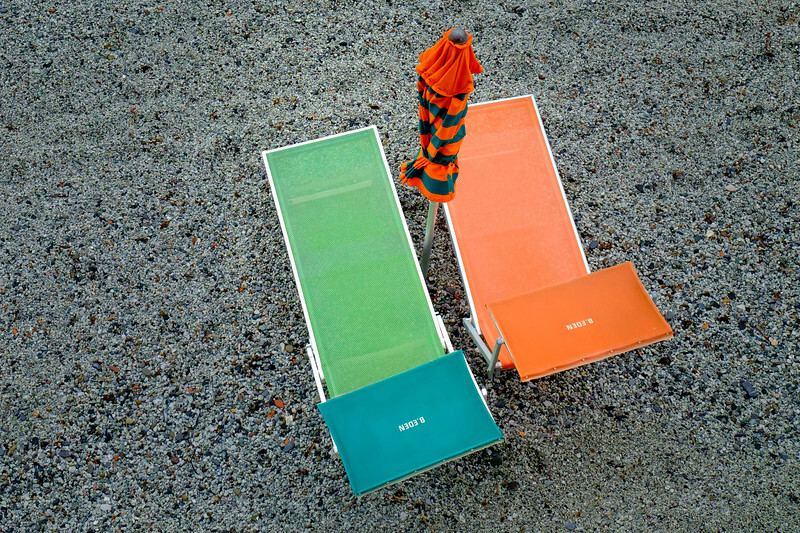 The only exception is Monterosso where hotels are much more common. After an extensive search, we found two nights accommodation in Riomaggiore and two more in Monterosso. Locals told me the main tourist season runs from early April to end of October with most places selling out months in advance. As an alternative one can stay in the city of La Spezia which is only a few minutes away by train. Just like my recent trip to New Zealand, I elected to travel light again; rather than taking the heavy DSLR gear I took my two X-series Fujifilm cameras (X-T1 and X-E1) and 4 Fujinon lenses! We started our photo-adventure in the most Southern village Riomaggiore and eventually ended up in Monterosso to the North. Lets give a small overview of all 5 villages starting from the most Southern one. Maybe because it was the first village we stayed in, but to me I felt most at home here. Even though it does get busy during the day with the thousands of tourists spreading across all five, at night it get its great small remote village feel back! Photographically it has a few good spots, including one where you need to climb across multiple large rocks acting like a breakwater. But be warned; depending on the tide and how rough the sea is at the time, this might lead to some wet clothes. Don't ask how I know this... The image I took from this particular spot was featured in last weeks "Pic(k) of the week". 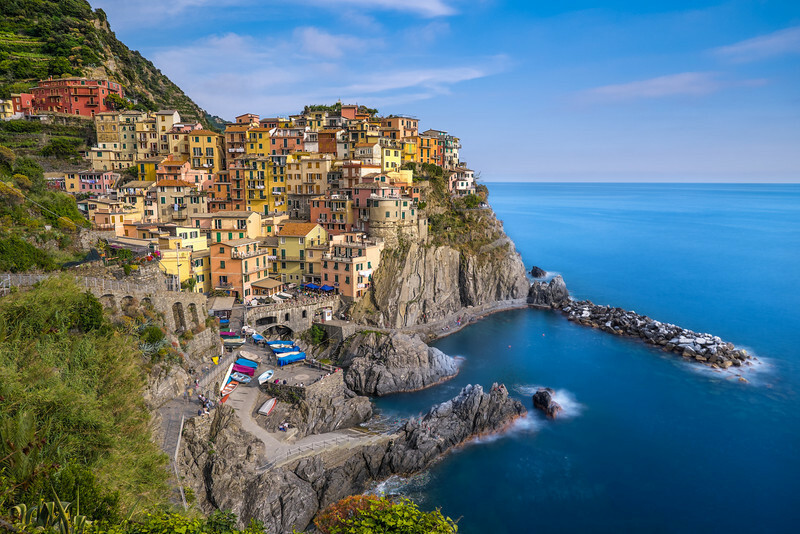 Because it is the smallest one, Manarola is often referred to as the baby of the family. Just like Riomaggiore it is a one street village with a small marina on the seaside. 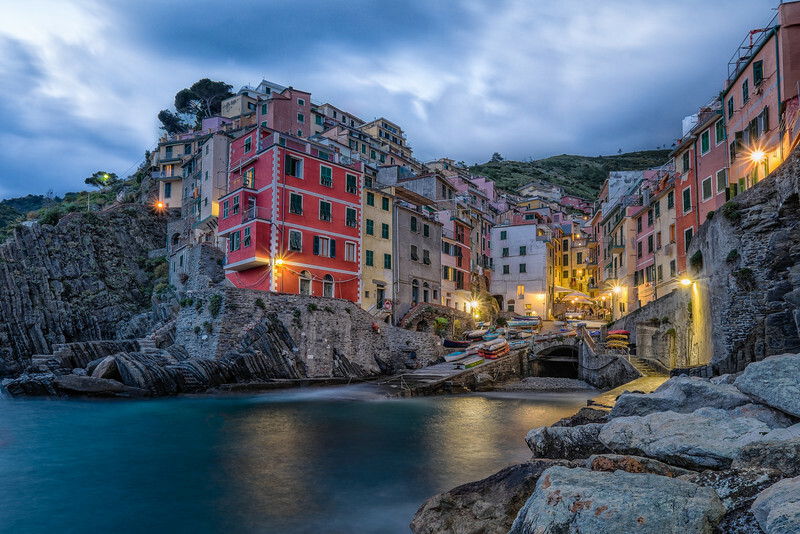 If only one image is shown of Cinque Terre, chances are high that it was made here! I personally find it to be the most photogenic village! A higher viewpoint to the Northwest close to a cemetery, makes for a great place to photograph during the blue hour. The image above was shot about 15 minutes after sunset. 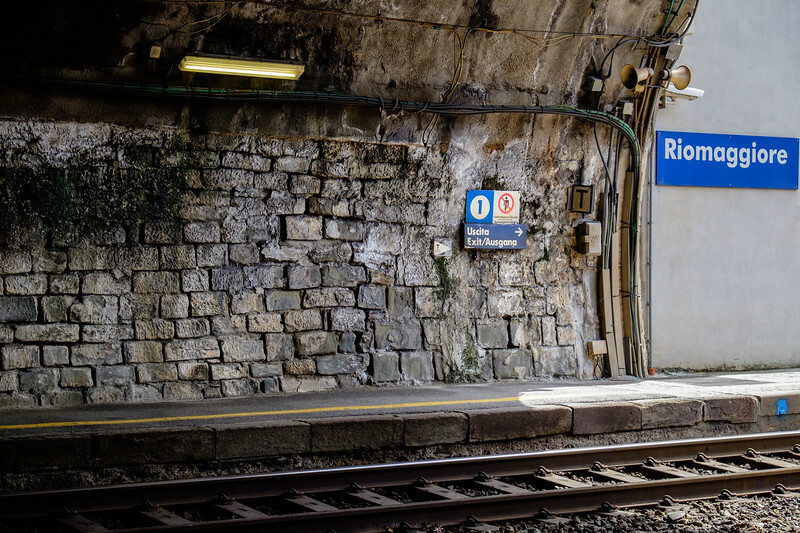 It is worth checking the train schedule if one does not stay in Manarola as the frequency of the trains goes down after 8pm. The only village that does not have a small harbour or marina and sometimes referred to as the middle child. The image above was shot from the ferry, which beside the train also connects all villages except Corniglia. Unfortunately I only managed to visit the village during the middle of the day when the light was too harsh for good landscape photography. Next time, I would definitively try to do some shooting around sunset as it looks very promising and not "over-shot" like some of the other places. After Manarola the second (some call it nr1?) most popular one for photographers... Its harbour with an attractive waterfront makes for nice photo-opportunities of the many small fishing boats and the surrounding church and castle. A few good places to photograph the village from a higher viewpoint can be found at the start of the hiking path to Monterosso. These proved to be very popular with a group of German photographers, who surprisingly left at sunset; just when the good light for blue hour photography was about to happen. The largest and most Northern village is also the most popular with non-photographer tourists, especially for the ones from North America and Australia. Unlike the others it has a large beach and a nice seaside promenade with plenty of restaurants and small souvenir shops for the hundreds of tourists which arrive daily by bus and cruise ship. Not exactly what one wants for great landscape photography! We did however use Monterosso as our base for day 3 and 4 in Cinque Terre as all other villages were fully booked. In hindsight and given I had more notice to organise the trip, I would have preferred staying in Vernazza. 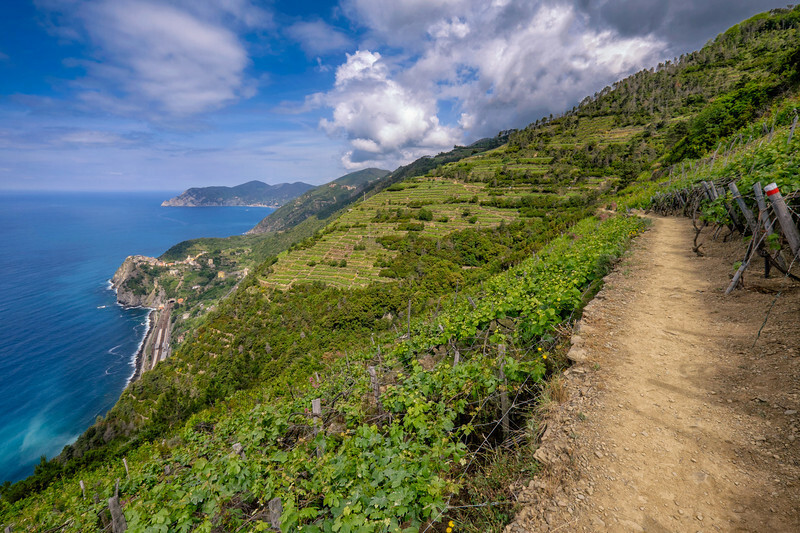 Beside the fact that most of Cinque Terre is extremely picturesque, it also attracts a large amount of people that come here for hiking. There are lots of great walking trails along the vineyards which given the local terrain can be quite demanding! 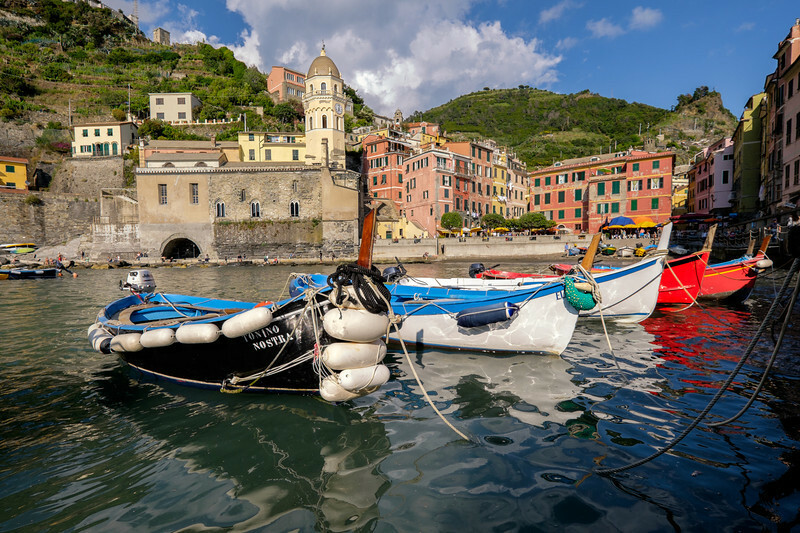 In October 2011, Cinque Terre was severely affected by torrential rains, causing floods and mudslides, especially in Vernazza and Monterosso where large parts of the villages were completely destroyed. Although most of the damage is now repaired, some of the walking paths remain closed. A 3 min slideshow about my latest photo-adventure trip can be found here. Today’s Pic(k) of the week is written from a comfortable passenger seat at 35000 feet, on a 6 hour flight from Milan to Dubai. Heading back from another great photo-adventure, it is the perfect time to reflect on the last 9 days of shooting two X-series Fujifilm cameras in Northwestern Italy. 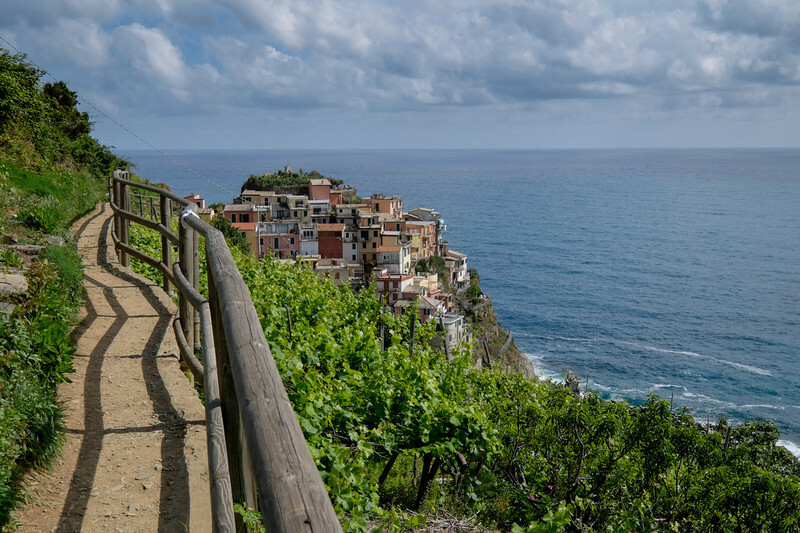 The main objective of the trip was documenting the Cinque Terre National Park; an amazing part of the Italian Riviera consisting of 5 very scenic villages about 3 hours West of Milan. As I will dedicate an entire blog-post to this beautiful part of Italy early next week, I do feel the need to share of my best shots as this weeks Pic(k) of the week! 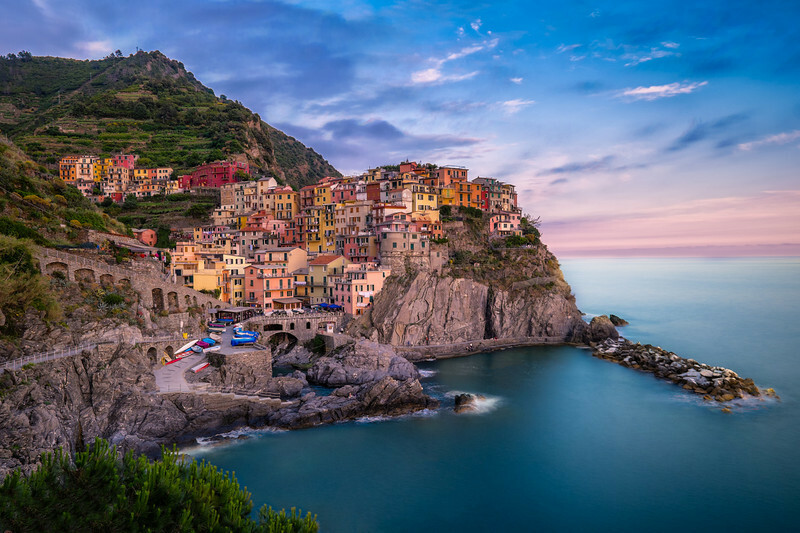 Next week I will give a complete overview of all of the Cinque Terre villages, but together with Manarola, Riomaggiore is clearly fighting to be the most photogenic of the 5! After having climbed across some very slippery rocks for a better viewpoint, I eventually framed the image below, just as the sun had dipped below the horizon. 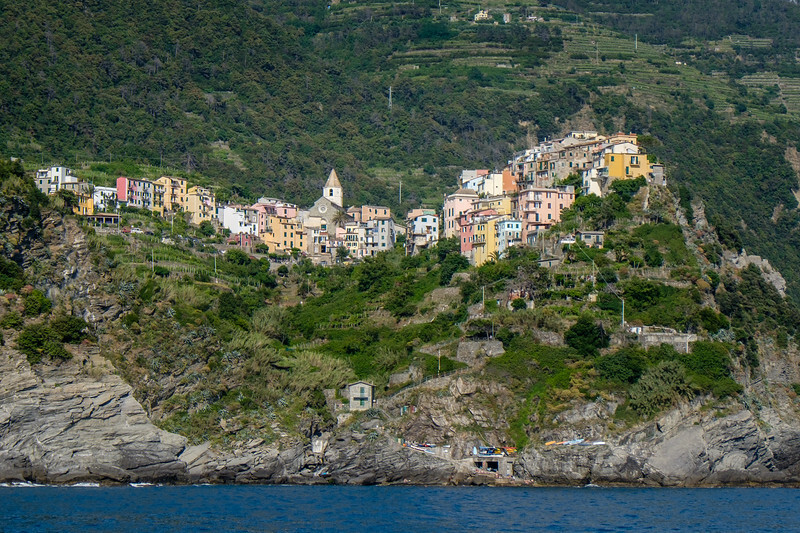 More images of the Cinque Terre area can be found here.